1. 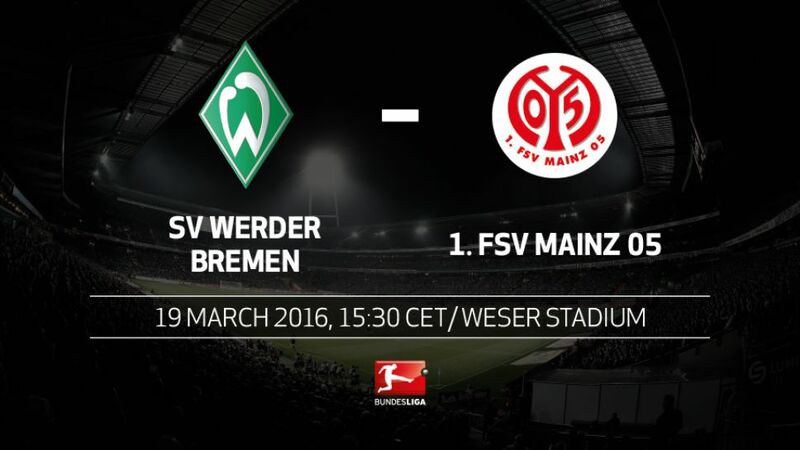 FSV Mainz 05 will be looking to close the gap to the top four when they travel to SV Werder Bremen on Saturday (kick-off 15:30CET/14:30GMT). Despite not winning since inflicting a shock defeat on champions FC Bayern München on Matchday 24, Mainz remain within touching distance of a UEFA Champions League place, with just two points between Die Nullfünfer and Borussia Mönchengladbach in fourth. With both VfL Wolfsburg and Bayer 04 Leverkusen breathing down their necks, though, MArtin Schmidt's side will be looking to get back to winning ways after losing at Borussia Dortmund last time out. Bremen had been resurgent until a 5-0 beating at the hands of Bayern last weekend. Prior to the defeat in Munich, however, Viktor Skripnik's side had breathed new life into their survival campaign with back-to-back victories over Bayer 04 Leverkusen and Hannover 96. The potential absence of star striker Claudio Pizarro is a worry for Die Grün-Weißen, who sit 15th in the table. Bremen have a worse goal difference than both TSG 1899 Hoffenheim and Eintracht Frankfurt, the two teams directly below them in the table.Werder's Matchday 25 victory over Hannover 96 was only their second home win of the season.Mainz have won none of their last three games against Bremen.Pizarro has won 12 of his 15 Bundesliga games against Mainz.Former Mainz player Anthony Ujah scored twice in Bremen's 3-1 win over the 05ers last October.